The special includes both sets and singles. 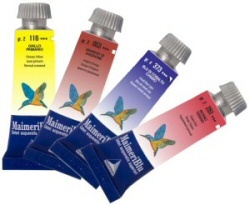 Sennelier l'Aquarelle is a honey based watercolour which is luminous, brilliant and intense. The addition of honey also makes it a very smooth paint to work with. 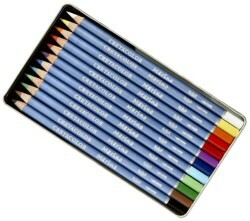 Sennelier l'Aquarelle has the advantage of modern pigments with the reliabilty of traditional methods. Maimeri Blu features an absolute purity of pigments that, together with gum arabic from Kordofan in the Sudan region, comprise the totality of the mixture. No blending powder, no additives, no fillers. Pure colours, nothing else. It is a watercolour that lets the artist's skill shine. 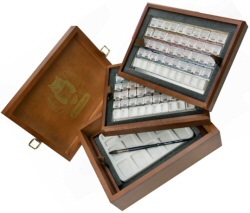 The ultimate Schmincke watercolour set comprising 80 Half Pans in a Wooden Box. A set to treasure. Schmincke are renowned for the intensity of colour they achieve and their watercolours certainly have great strength and clarity of colour which can make lesser watercolours look somewhat dull. The special covers both the watercolour and multi-purpose palettes. Holbein palettes are very good quality. Of special note are the metal enamelled waterolour palettes which have rich deep black enamel on the outside and extremely smooth rich white enamel on the inside. Marino captivates with its brilliant colours and soft stroke. Marino have exceptionally high lightfastness ratings. When dissolved with water clear lines flow into smooth transitions to produce stunning watercolor washes. Fully blendable colors achieve an infinite number of shades. All of the watercolurs we range are of artist quality but each has something noteable about them which sets them apart from the others. Vivid, brilliant, transparent colours. Excellent handling. The modern watercolour. 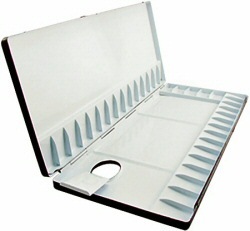 Unique Binder. Depth of colour with minimal colour shift from wet to dry. Intensity of colour and clarity. The original moist watercolour. Excellent reliability and quality.